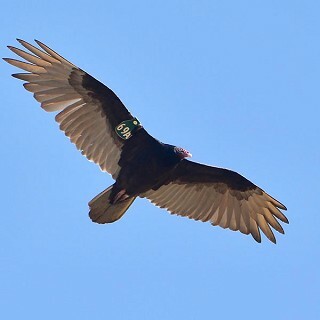 If you see a turkey vulture soaring overhead, perched in a tree, on a pole or slurping up road-killed deer guts, and it's wearing a patagial tag, please send me an email ASAP: jimnaturalist@gmail.com. After you have notified me that one flew over the cuckoo nest, google "Bird Banding Laboratory." The first prompt you get will be "Banded Bird Encounter Report." Open that and follow your nose, and you will eventually be at the page where you can tell the banding lab what you've seen. In a few days you will receive a certificate of appreciation from the lab for sending in your sighting and information. You will probably cause a scientist in Canada to leap off his or her seat and shout, "Hey, we got a recovery from Sisters, Oregon! How about that!" That in turn will cause a whole bunch of scientists in the program to start rethinking what they thought was going on with TVs in Canada, and the U.S. as well. There may be a relationship with the TVs that visit Oregon in summer that could be related to climate change. Numbers of birders over in western Oregon are seeing TVs today in places where we usually don't see them until late February. For example, on Tuesday, January 29, at about 10:30 a.m., a birder in Toledo reported seeing a TV. Then, my old pal Chuck Gates, retired science teacher from Ochoco High School and a long-time birder, reported photographing a TV at Fern Ridge Reservoir in Lane County, also in The Swamp. On that same day another birder in Eugene put this up on the Oregon Birders On Line (OBOL) website: "That's near a site that has been a winter roost for maybe 15 years. Toledo is probably an early migrant, but there are enough wintering in SW Oregon these days that it may not have come far." So, perhaps not all the TVs that breed, eat dead sheep, cows and road-kills in the Willamette Valley go off and spend the winter near Baja, Mexico and the Imperial Valley in Central California. The birders who are vital to the science of ornithology are the ones who keep accurate records. They are the Citizen Scientists who furnish data that helps the scientific community understand the life history of birds. Events such as The Christmas Bird Count are a wonderful example. Can you imagine what will go through a TVs mind when it comes soaring over the deer winter range and smells the delicious aroma wafting up from those deer that perished in the Big Snow of 2019? They'll think they've died and gone to heaven, as did the coyotes, bobcats, eagles and other meat-eaters who discovered them earlier.